How should I clean the inside of my product? Clean your scanner regularly to make sure that no dust builds up on the glass scanning surfaces. Dust can cause spots or lines in your scanned images. Note: The illustrations show the ES-500W/ES-500WR, but the instructions are the same for the ES-400. Pull down on the cover open lever and open the scanner cover. Use a genuine Epson cleaning kit or a soft, moist cloth to wipe off any dust or dirt on the glass scanning surfaces and the rollers inside the scanner cover. If the glass surface is stained with grease or some other hard-to-remove material, use a genuine Epson cleaning kit to remove stains. Use a small amount of cleaner on the cleaning cloth to remove the stains. Wipe off all remaining liquid. Do not spray glass cleaner directly on the scanning surfaces. Be careful not to place too much force on the glass. Use a cotton swab to wipe off any dust or dirt on the sensors. Do not use liquid or glass cleaner on the cotton swab. Wipe off any dust or dirt on the separation roller using a genuine Epson cleaning kit or a soft, moist cloth. Use only a genuine Epson cleaning kit or soft, moist cloth to clean the roller; using a dry cloth may damage the surface of the roller. Wipe off any dust or dirt on the pickup roller using a genuine Epson cleaning kit or a soft, moist cloth. Plug in the AC adapter and press the power button to turn on the scanner. 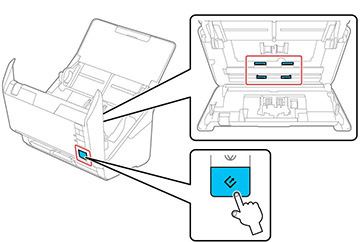 Hold down the start button for at least two seconds while opening the scanner cover. The rollers on the bottom move momentarily, and then the scanner enters cleaning mode. Press the start button several times to rotate the rollers shown here. Use a genuine Epson cleaning kit or a soft, moist cloth to wipe off any dust or dirt on the rollers as they rotate. Repeat this step until the rollers are clean.